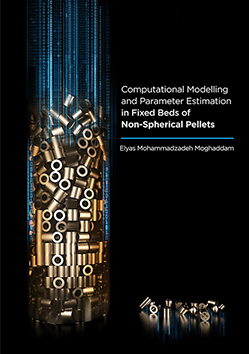 The main aim of this research is to develop and validate/benchmark an efficient and integrated workflow to predict the in-situ behaviour of hydrodynamics and thermal field in fixed beds containing non-spherical and even non-convex pellets with high accuracy. The workflow consists of a sequential Rigid Body Dynamics and Computational Fluid Dynamics (RBD-CFD) approach, applied to perform particle-resolved CFD simulations in fixed beds of (non-)spherical and non-convex pellets. RBD is an analytical scheme capable of simulating the dynamic behaviour of assemblies of pellets based on Newton’s laws of motion and Lagrangian mechanics. The concept of RBD is used to develop a hard-body random packing algorithm to synthesize realistic packing structures of non-spherical pellets. The proposed algorithm uses impulse theory together with a quadratic optimization routine to model collision phenomena. The RBD-algorithm is used to generate random packing of spheres, cylinders and Raschig rings and then benchmarked against published analytical and empirical data. Using the RBD-algorithm, the influence of physio-mechanical properties of pellets such as friction and restitution coefficient on packing densification are investigated. The workflow, i.e. RBD-CFD methodology, is then benchmarked for a wall-heated fixed bed problem, where particle-resolved CFD simulations of hydrodynamics and heat transfer are performed in laminar, transient and turbulent regimes, for 5≤Rep≤3,000, in random packing of spheres, cylinders and Raschig rings with tube-to-pellet diameter ratios ranging from 2.29 to 6.1. The results are compared with literature data concerning azimuthally-averaged axial velocity profile, pressure drop and particle-to-fluid heat transfer Nusselt number, Nufs. The post-processing of RBD-CFD simulation results reveal a large influence of local structure on the velocity and temperature distributions at the pellet scale, particularly in narrow packings, where the spatial heterogeneity of the structure is very strong along the bed axis. Compared to random packing of spheres, in random packing of cylinders and Raschig rings more intense inhomogeneities in local velocity and temperature fields are observed. This feature is completely neglected when using pseudo-continuum models with averaged parameters.